sErththi koNdu – due to that connection. 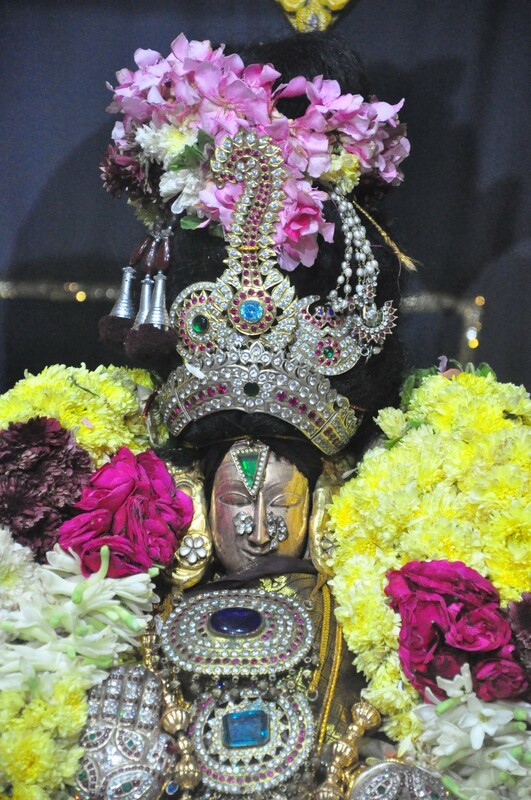 He (maNavALa mAmunigaL) divines with examples using two pAsurams, about what would happen due to association with the noble and the opposite type of people who were described in the previous pAsuram. Out of that, in this pAsuram, it talks about what one would get due to association with noble people, by ‘nalla maNAm’, etc. nalla maNam – is – one having fragrance that would remove the the bad smell of other things. That is, as said in ‘AmOdhavath kusuma samvalanEna yadhvadhAmOghavAn bhavathi kESAbharOpya gandha: [jIyar nAyanAr vadamozhi mAlai – 69]‘ -> for the hair locks that are having fragrant flowers, its nature of having stale smell due to entanglement would be gone and become fully fragrant like said in ‘maNangaL nARum vAr kuzhalAr [periya thirumozhi – 10.3.4]’ (~those having well set hair that is spreading fragrance). nalla guNam, etc. – For those having association with those having the fragrance like said in ‘naRiya nanmalar [thiruvAimozhi 5.5.11]’ (~ good and fragrant flowers) that is SEshathva gyAnam (knowledge that we are subservient) and having good qualities of knowledge, devotion, steadfastness, etc., – due to the connection of such association, they would get, without any smell of illiteracy, that noble quality only. So, by this, it can be concluded that the noble qualities that he gets is due to the association with noble people. AchchAn piLLai too divined – ‘bhAgavatha samslEsham baghavath samslEshaththaiyum piRappiththu, abhAgavatha vislEshaththaiyum piRappiththu ivanaiyum karaimaram sErththu vidum [? ]’ (connection with devotees would create connection with emperumAn, and disconnection with non-devotees, and will get him to the shore (reach the true goal)). It is said ‘sathsangAdhbhavathi hi sAdhuthA akhilAnAm’ (since he is with the noble people, he is being good to everybody). This entry was posted in Other, upadhESa raththina mAlai and tagged 74, annan, erumbi, erumbiappa, gunam, kovil, mamunigal, manam, manavala, nalla, pasurams, rathina, rathinamalai, raththina, raththinamalai, serthi, serththi, upadesa, upadhesa on February 9, 2016 by raghuram.